The Cultural Revolution ruthlessly targeted Chinese musicians and composers working in the Western Classical idiom, such as the heroically defiant He Luting, the director of the Shanghai Conservancy, who dared to defend Debussy. When Richard Pontzious arrived to teach at the Conservancy in 1983, he found very few instruments had escaped the destruction of Mao’s systematized terror. Such problems were not exclusive to Mainland China. Western classical music was not publicly performed in Vietnam until the 1990s. Yet, Pontzious had a dream of a multi-national Asian student orchestra. Oscar winning filmmaker Ruby Yang introduces viewers to the incoming class of the Asian Youth Orchestra (AYO) as they prepare for their three-week life-altering, career-making season in the short documentary In Search of Perfect Consonance (trailer here), which screens this afternoon in New York, and Saturday and Sunday in Los Angeles. Silver-haired Pontzious has built the AYO into a highly regarded institution throughout Asia. Although membership was dominated by Japan in its early years, representation of Chinese speaking territories has swelled in recent years. Yet, as some AYO faculty explain, instruction at Chinese music schools so overwhelmingly focuses on individual soloists, they often have much to learn about ensemble playing (the irony of this is so obvious it hardly needs pointing out). Regardless of their varying skill levels, the AYO members (all of whom were selected through an audition process) are highly motivated. Frankly, it is always invigorating to see such eager and dedicated young musicians, regardless of the style or idiom. However, twenty-three-year-old Hong Kong double bassist Charlie Tsz Ho Wong might just be the most inspiring. After the death of his mother, he endured his deadbeat father’s chaos, paying for his instrument and lessons out his own wages. Frankly, his story could easily sustain another doc of roughly equivalent length (thirty-eight minutes). There is also plenty of room for Yang to expand Consonance with more musician profiles. As luck would have it, the other standout interview subject happens to play the double bass as well. Hailing from Japan, Mayu Ohkado forthrightly discusses her shyness and the confidence she gained through playing with the AYO. 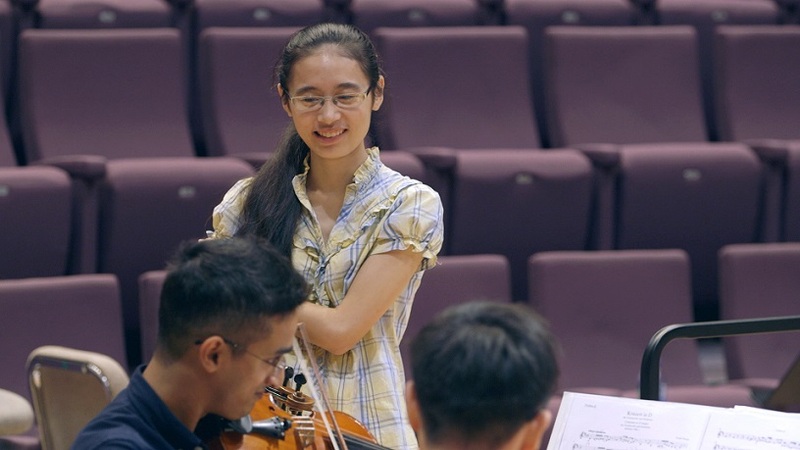 While not belaboring the point, Yang makes it clear there are many benefits to playing in a unified ensemble like the Youth Orchestra, beyond the professional (although they have alumni playing in symphonies around the world, from Milwaukee to Qatar and throughout Asia). Not to be spoilery, but this year’s class sounds fantastic when they finally hit the road. Beethoven’s Ode to Joy is obviously their big set closer and it is fitting. Whether or not it promotes peace to any extent, the AYO certainly keeps the music living and vital, which is a worthy accomplishment. 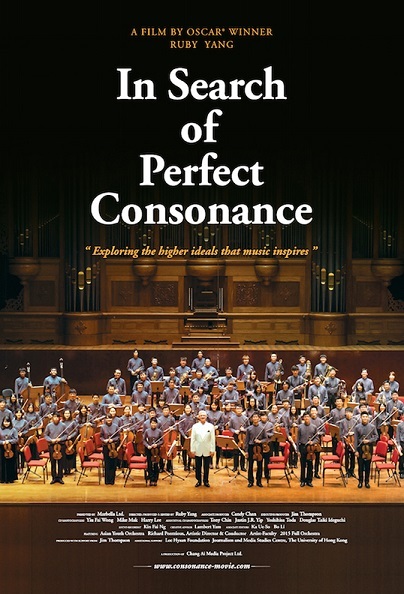 In Search of Perfect Consonance should definitely be a short doc Academy Award contender, especially since Yang previously won the Oscar in this category in 2007 and was nominated again in 2011 for Warriors of Qiugang. Highly recommended for all music fans, it screens this afternoon in New York, as part of the Chelsea Film Festival and has special screenings this Saturday (10/15) and Sunday (10/16) at the Laemmle Monica Film Center and Laemmle Playhouse 7 in Los Angeles.